As I mentioned in my post ‘Fall Blooming Plants for Bees,’ there wasn’t much honey to harvest this fall because our summer nectar flow occurred earlier than usual. In fact, I only took ‘extra’ honey from two colonies out of seven. While four others have some curing nectar and capped honey, they do not have the recommended 3-4 frames of capped honey, and I wonder if they will starve this winter. 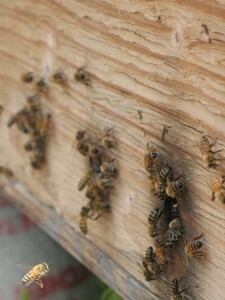 It’s tempting to start feeding, but we have adopted the ‘natural selection’ view of beekeeping. The more we interfere, the more we facilitate the propagation of bees that require help to survive. 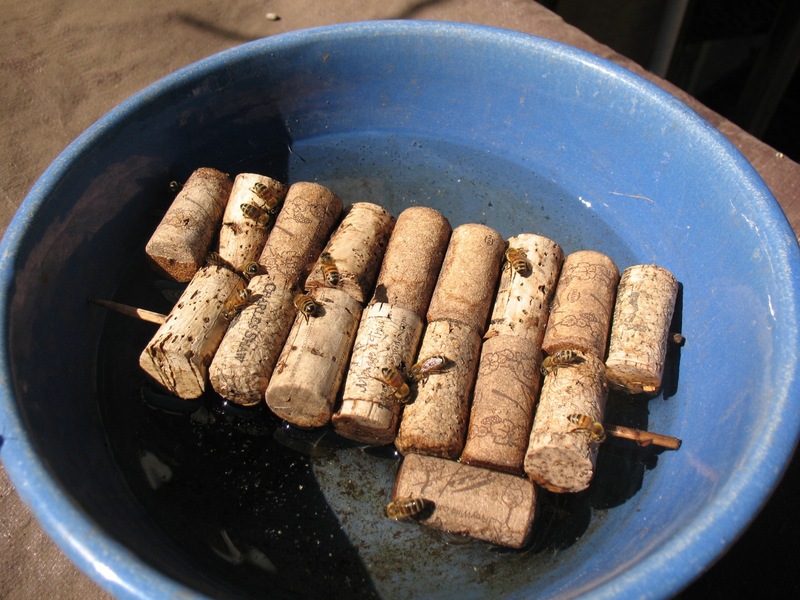 We would rather propagate bees that can adapt to whatever conditions present themselves. Last year, we had one hive with zero stores going into winter that survived. In our climate and in the suburban locales where we keep our hives, the bees can find forage nearly year-round, if it’s not too cold to fly. The Farmer’s Almanac calls for a bitterly cold winter this year, but the Almanac has been wrong for the last few years. We’ll keep our fingers crossed. Four of the six hives I inspected through September had excellent populations, and two in particular had excellent brood patterns. Two of the colonies may ultimately dwindle. One had abandoned half of box two to wax moths, and I performed a massive clean-up job. The other seemed abnormally agitated, and their numbers seemed a little small. I finished rearranging and condensing all the hives by mid-October. With the use of follower boards, we’ve taken advantage of the ability to condense hives vertically rather than horizontally. 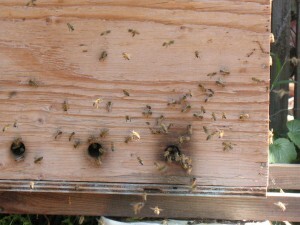 For example, we had a small colony last fall that we could have condensed to one brood box, with 10 frames. Instead, we condensed to two brood boxes, with 6 frames each, under the assumption that a small cluster would be more able to move upward to their stores as a group, rather than disbanding to access stores on the outer edges of a box. Follower boards have the added advantage of allowing for easier frame manipulation. 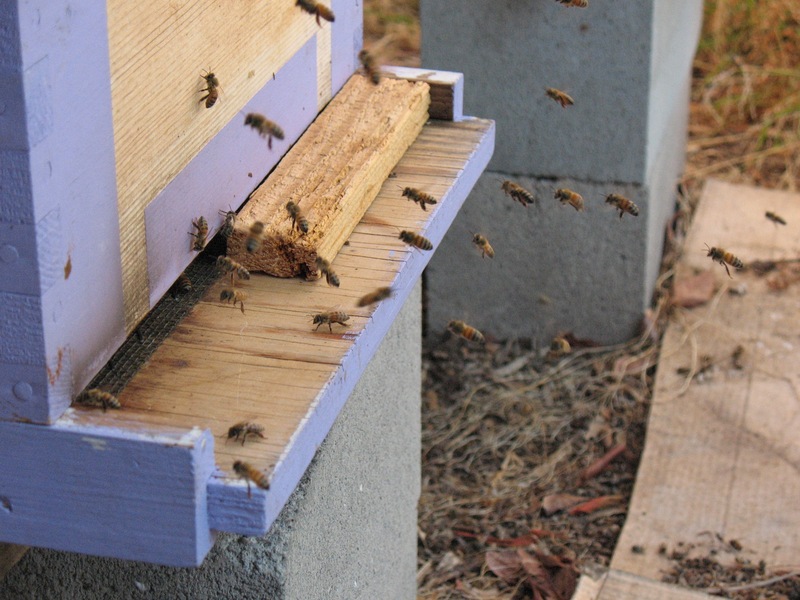 When inspecting a hive, you remove one follower board and about 2″ of space opens up. The common configuration is 8 frames sandwiched between 2 follower boards per 10-frame box. For those who haven’t heard of follower boards, they are essentially solid frames. 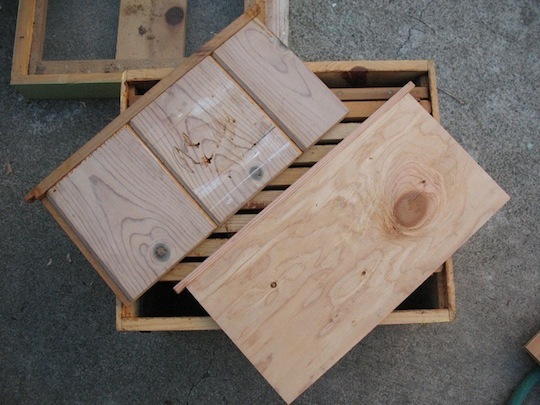 When I made them with a beekeeping friend, we used tongue-in-groove planks cut vertically to size (mediums or deeps). We also cut to size a strip of wood that acted as the top bar, and screwed it into the sections of wood. The ones I buy are made of 1/2″ plywood with solid wood top bars. 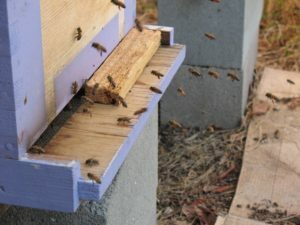 In addition to allowing for a wider variety of hive configurations and making frame manipulation easier, Serge Labesque asserts that follower boards promote air circulation. In theory, air convects upwards from the entrance and screened bottom board between the outermost frames and follower boards and exits through the inner cover out of the nest. 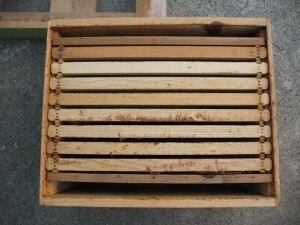 Excess moisture is transported out of the hive via this airflow. 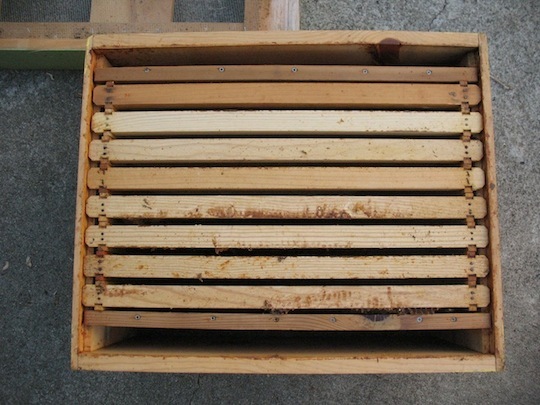 Further, the space between the outermost frames and follower boards has an insulating effect, protecting the brood nest from extreme heat in summer. Beekeeping still remains much of a mystery to me. We continue to find whatever balance we can between caring for our bees and interfering with them as little as possible. We want healthy bees, but we don’t want the responsibility to be solely ours. In our struggle, we hope we are helping the bees become stronger. While the chickens ran around one evening, I planted some new plants in the pollinator bed: Sedum ‘Autumn Joy,’ Zauschneria ‘UC Hybrid,’ Gaillardia ‘Golden Halo,’ and an ornamental Oregano called ‘Brittany Show.’ Additionally, I replaced the dead sorrel and Agastache foeniculum (Hyssop) in the herb bed with Stevia and Agastache foeniculum ‘Golden Jubilee’ (‘Golden Jubilee’ Hyssop). Our bees are having a hard time this fall. When Sarah and I inspected hives in July, we thought we were in for a bumper crop of honey. When I started going out in early September, however, I discovered a different story. Most of our hives don’t seem to have enough stores to get through winter. Many beekeepers in our area are experiencing the same phenomenon. The consensus is that our mild winter and cool summer pushed the plants that comprise our summer nectar flow to bloom much earlier, and that our lack of usual rainfall reduced nectar production. The bees accordingly were up to their roofs in honey back in July, then started using their stores as summer wore on (US Honey Report September 2013). 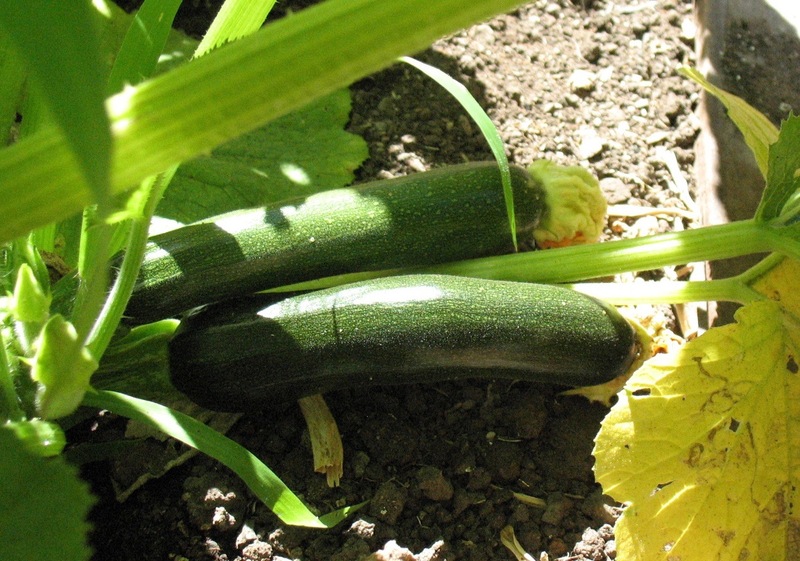 While ‘Fall is for planting’ might have begun as a marketing ploy for nurseries to encourage sales during a slow time, it is a great time to plant. And, it’s an especially great time to plant fall bloomers for the bees. Here’s a list of plants I see humming with activity in my travels. They do well in USDA Zone 9b, but many will perform in other zones, too (click on the link to find your zone). Agastache species: Both the herb (A. foeniculum or Hyssop) and ornamental species (especially A. mexicana and A. aurantiaca cultivars & hybrids) attract bees, but the ornamental species bloom all summer and fall for us. I’m not sure how bees get to the nectar, because the flowers are long, but they must. Alyssum: An annual that takes care of itself. Bees hit it when there’s not much else happening, like now. Baccharis pilularis & cultivars/Coyote Brush: A California native not necessarily attractive enough for a small garden, but good for hot slopes and farther-away spots. Basil: It’s hard to let basil go to flower, because the leaves become spicy and bitter, but if you do, the bees will come in droves. I like to cut basil back on rotation: I cut a few plants back for me, and leave others in flower. Then I return and cut back the ones in bloom, and leave the ones I’ve been harvesting to flower and so on. Borage: Always a favorite, whenever it is blooming. Ours reseeds itself all year long, and blooms whenever it’s ready till late fall. Caryopteris x clandonensis cultivars, such as ‘Dark Knight’ and ‘Blue Mist’/Bluebeard: This is a woody, deciduous perennial/sub-shrub that most folks around here don’t appreciate. 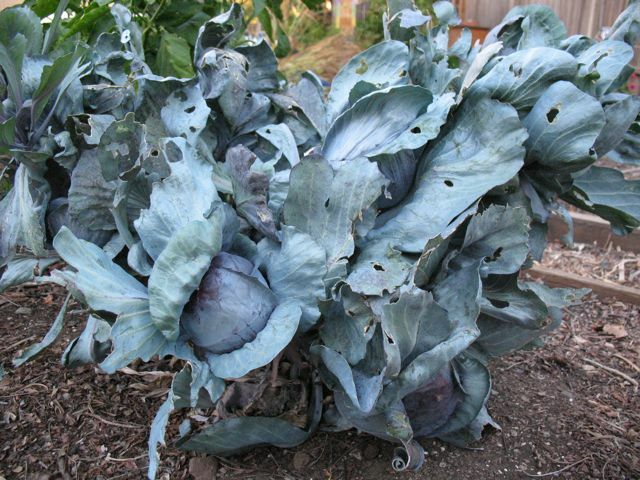 That’s too bad, because it is one of the best fall bloomers for bees. Cuphea hyssopifolia/Mexican Heather: This one surprised me, but I have seen bees on it throughout the year, especially in fall. This plant has faded from the nursery scene around here because it freezes most winters, but I have some clients who still have it, and it’s a keeper. 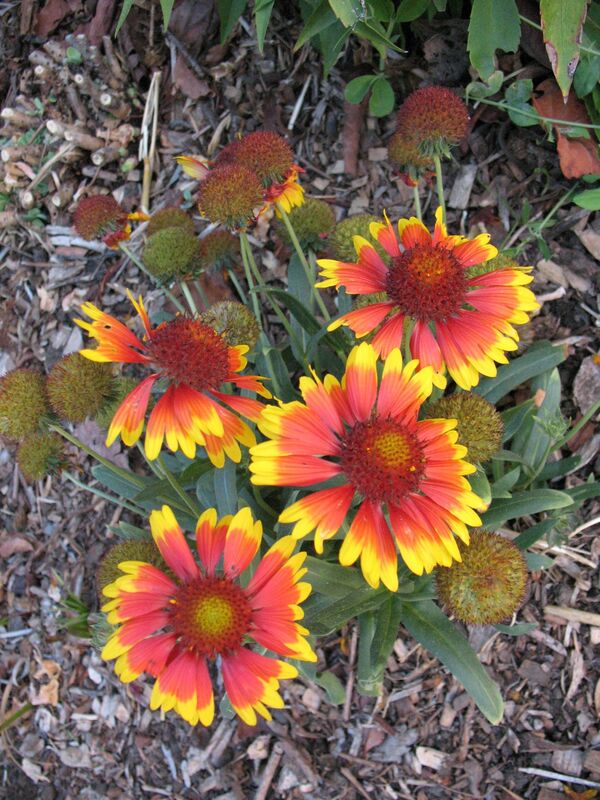 Gaillardia grandiflora cultivars/Blanket Flower: A bee favorite, but not always a long-lived perennial, especially if it gets too much water. 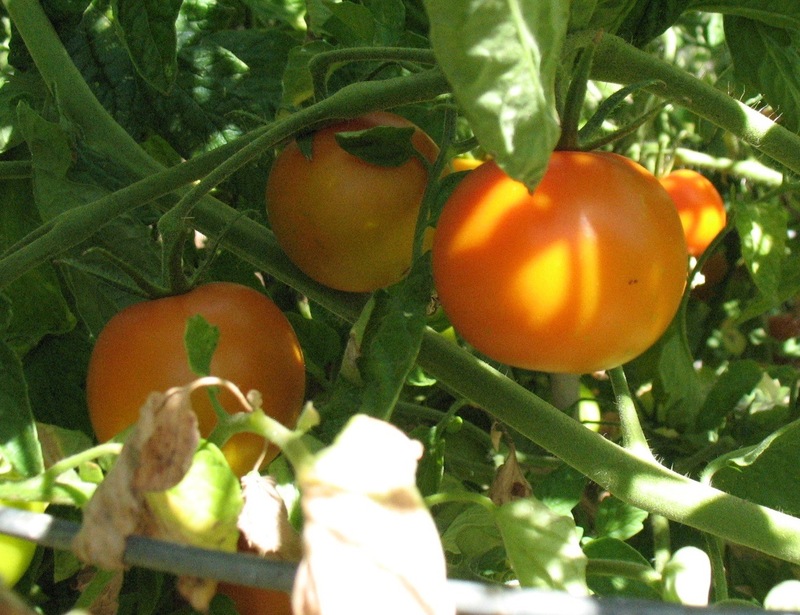 ‘Oranges & Lemons’ often blooms year-round for us. Gaillardia is worth it, even if it’s short-lived. Lavandula stoechas & varieties/Spanish Lavender: Reblooms for us about now, and much appreciated by bees, who generally love lavender. 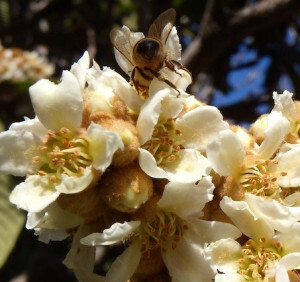 Loquat: This might be a winter bloomer, but ours is blooming now this year. Nepeta x faasseni and cultivars/Catmint: Follows up its summer bloom with a lesser show through fall. Origanum vulgare/Oregano: The edible oreganos, both Greek and Italian, bloom about mid-summer through fall. Italian oregano in particular gets rangy and the bees’ activity on it never really slows, so I always struggle to decide when to cut it back. 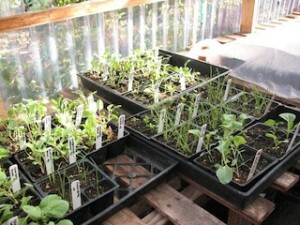 This year, I cut it back in stages (see Basil above). It’s already reblooming. Rosmarinus officinalis ‘Irene’/’Irene’ Trailing Rosemary: A trailing form that stays flatter, and seems to bloom most of the year. Salvia chiapensis/Chiapas Sage: For us, blooms nearly year-round, until it gets very cold. In fall, it is much visited. Salvia ‘Hot Lips’/’Hot Lips’ Sage: Another year-round favorite, till it gets cold. You’ll also see hummingbirds and various native bees on this one. Sedum spectabile cultivars: Definitely a bee favorite. I only wish it had secondary blooms and bloomed longer. Thymus/Thyme: Another herb that blooms summer and early fall, or longer, depending on how much water you give it. English thyme seems to bloom longest, and the creeping or groundcover cultivars will throw a smaller second bloom in fall. Trichostema lanatum & cultivars/Woolly Blue Curls: A California native that blooms in the pollinator bed nearly all year, till it gets very cold. 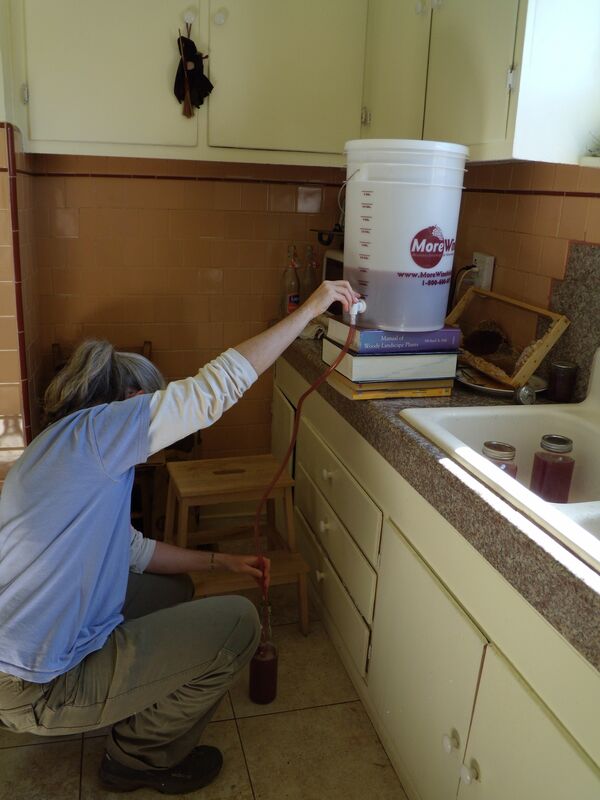 I have read that the honey from Trichostema crystallizes quickly. One of the by-products of my plum juicing was a few pounds of skin, pits, and pulp with some juice to spare. While I researched plum wine recipes, one of the simpler ones I encountered was Japanese Plum wine, or Umeshu, more like a cordial or liqueur with no yeast and racking involved. 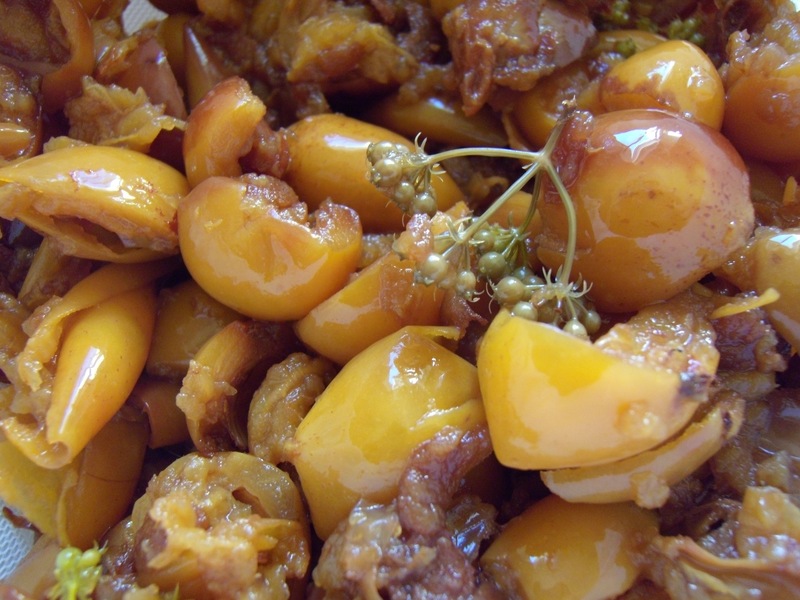 While it calls for unripe Ume plums, a traditional Asian plum on the sour side with low juiciness, the recipe suggests Western plums, apricots, and quince might substitute nicely. For us gardening nerds, Ume plums are the fruit of Prunus mume, which in this hemisphere is known as ‘flowering apricot,’ and which is the mother of several cultivated varieties, such as the once-popular ‘W.B. Clarke,’ a beautiful weeping form. In my early gardening years in Oregon, these small, flowering trees burst out in pink to white bloom in the late winter rains of the Willamette Valley. Not wanting to waste the pulp, I decided to see if I could make a not-so-traditional Umeshu wine with it. While I wasn’t able to find rock sugar, I found the shochu recommended in the recipe. This is a clear alcohol, typically between 25 and 42 proof, commonly distilled from sweet potatoes, barley, rice, buckwheat, or some other grain. I found one made from barley, 48 proof, in the ‘Vodka’ section of a chain liquor store. I weighed my pulp to calculate the right proportion of cane sugar. The recipe calls for a ratio of 1 pound plums to 1 pound sugar for Ume wine. Since I used Santa Rosa plum pulp, I decided to use less sugar, roughly following the 60% plum and 40% sugar recommendation. Since my math skills leave much to be desired and I am a terrible record keeper, I suspect I weighed the plums, then halved the weight and added that amount of sugar plus some so that the sugar weighed about three-quarters what the plum pulp had (eg, if I had 6 pounds of pulp, I added 3 pounds of sugar, plus about 1 pound. See what I mean?). 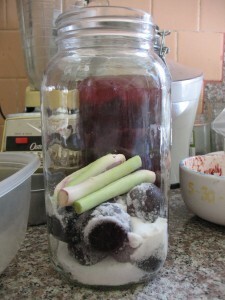 I used a 2 1/2-quart jar with a rubber gasket lid, layering the plum pulp with the sugar. I decided to add fresh tarragon from the garden for a twist, placing five or six 4–6″ sprigs in two of the three layers. I finally covered it all with shochu. 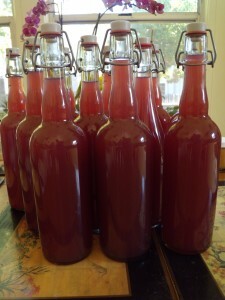 Since we had a small Santa Rosa plum harvest, I decided to also make a batch of plum liqueur with whole plums, more like the recipe. 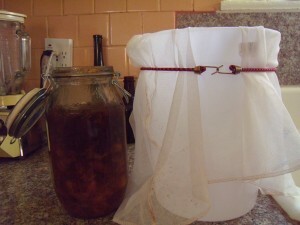 For this batch, I used a 2-quart mason jar with a screw-on lid. I again used the 60% : 40% recommendation, or something close. 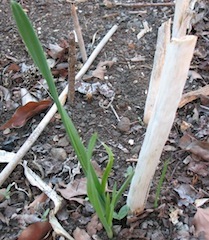 I also added 4 chunky stems of lemongrass from the garden in one of the layers. Since the recipe states that the jar should only be filled halfway, I did so, then added the shochu to cover the plums et al. For the record, I should share a few modifications. First, because the plum pulp was so dense, and I could see air pockets in the jar, I decided to shake the jar after a few days to dissolve some of the sugar so that the shochu could penetrate to the bottom. This dissolving might have happened on its own, but I tend to worry a bit, so I facilitated the process. Second, after about a month, I ended up adding more shochu to both jars. 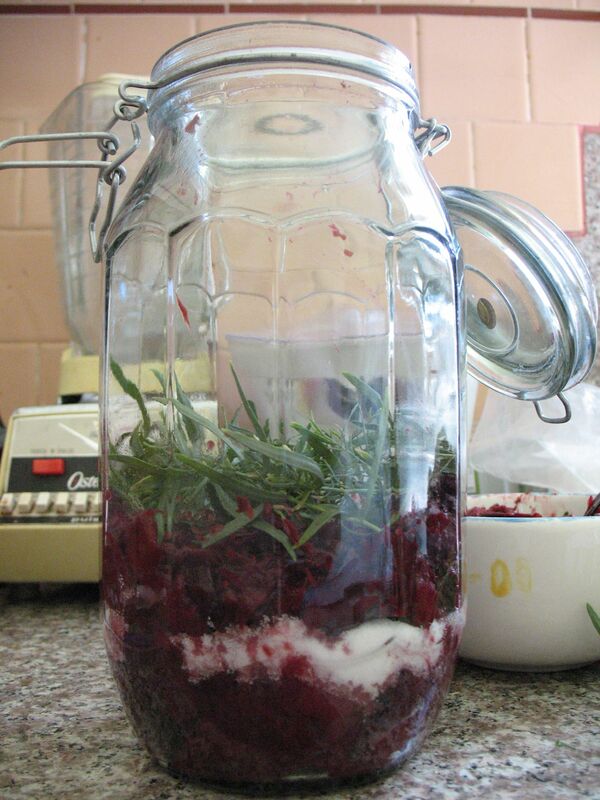 In the mason jar with the whole plums, a bit of mold formed on a part of a plum above the level of the shochu. I opened the jar and removed the mold, then added more shochu, so that it was well above the level of the plums, to about the 3/4 mark of the jar. I also changed out the lid for a new one. To be safe, I added more shochu to the other jar, too, nearly to the top. 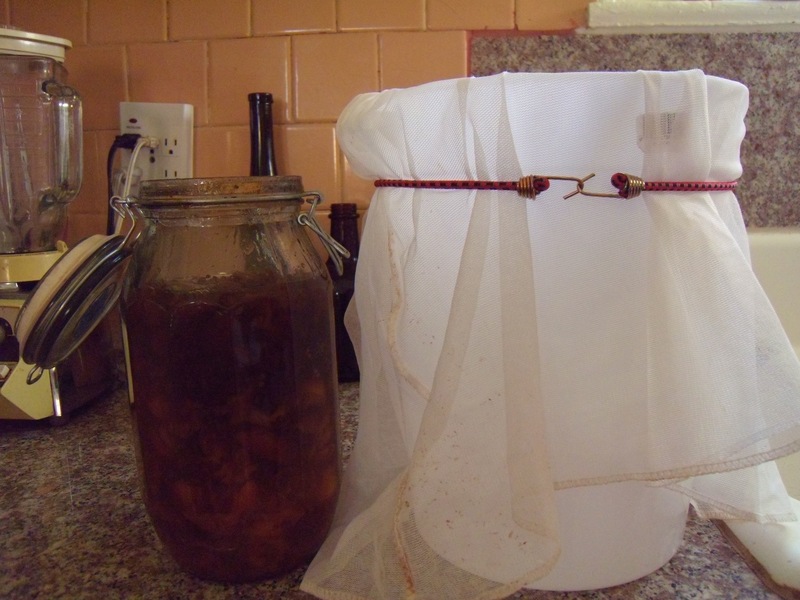 Throughout the next five months, I shook the contents of both jars gently to guard against further mold growth. It seemed to work. 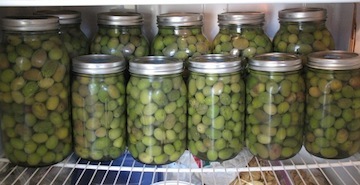 Neither jar exploded, as the author has experienced. 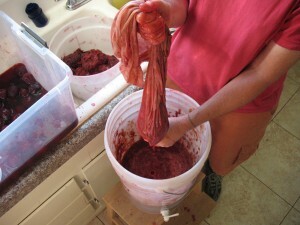 A few weeks ago in mid-January, I strained the contents of the plum pulp liqueur. 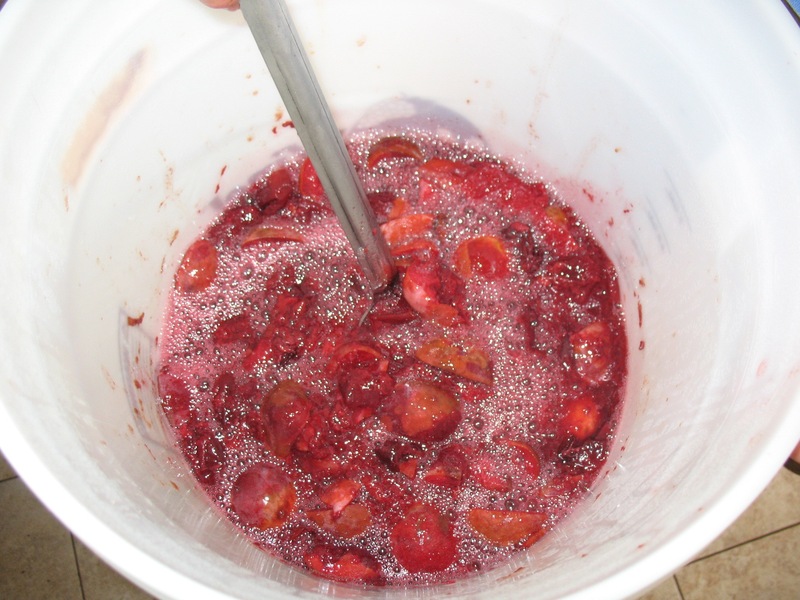 I used a fine mesh bag that I had used to juice the plums, and ‘milked’ the contents into a bucket and bottled it. 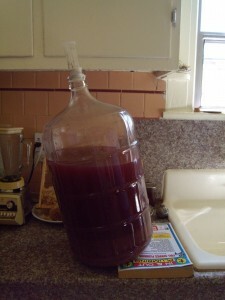 This batch is amazingly jammy and velvety, and has quite a bit of sediment, which I am ok with. We couldn’t taste the tarragon at all. I probably used too little, since I was worried about an overwhelming taste or bitterness. Next time, I might lightly bruise it. 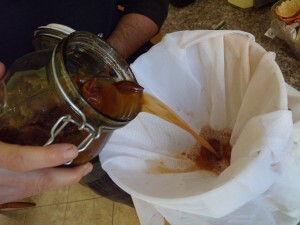 In this batch, the ratio of solids (plum, sugar) to liquids (shochu) was roughly visually equal. I then strained the other batch, made with whole plums. Again, we could not taste the lemongrass. If I were to use lemongrass again, I would lightly crush it. Since this batch had a significantly higher ratio of alcohol to solids, we had to take a few tastes before deciding we really liked it. The shochu imparts a little sweetness, but the plum taste comes through, less jammy, but fruity nonetheless. This batch, too, has quite a bit of sediment. I suspect that if I had not squeezed out nearly every drop of liquid in both batches, the sediment might not have made it through the bag’s filter. 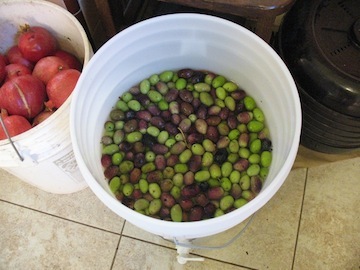 In both batches, the sugar content did not detract from the fruit’s flavor, but I would still add less next time, say, half or one-third the weight of the fruit. 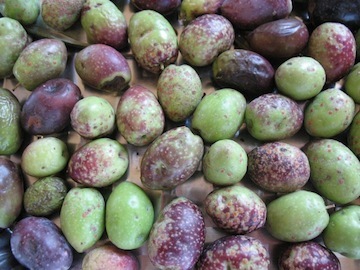 Santa Rosa plums have a nice balance of sweet and tart, which I would like to experience more in the liqueur. And I am going to use this rough fruit to sugar ratio in the next liqueur recipes I’m dreaming up. 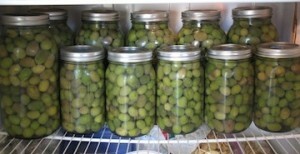 I hope the ratio is rather universal, and not specific to plums, apricot or quince. The success of the plum pulp liqueur suggests that it may be possible to use fruit debris left over from other projects to make a liqueur; I even thought of reusing the pulp just to see what kind of flavor I would get on a second generation batch. But I decided to move on to the next creation. I have been bitten by the liqueur bug.